It’s about time you took a break from the rigours of work and city life and visit one of Australia’s most iconic regions. Talga Estate has earned a reputation as one of the most luxurious retreats available in the area with a perfect combination of comfort and location providing you with the ideal ingredients for a relaxing holiday. Within a stone’s throw from Hunter Valley Gardens, our self contained accommodation in Lovedale is the ultimate getaway and will rejuvenate your mind and body. We provide accommodation for couples and groups to allow you to experience the best the region has to offer. With both single and two bedroom villas on offer, each is set for your ultimate comfort. Slip under the cosy electric blanket and rest your head on the plush pillows for a fulfilling night’s sleep, and pull back the curtains so you can rise to the gentle sunlight or keep them closed for a treasured sleep in. Then, experience the two-person hydrotherapy spa, which helps rejuvenate your body and mind. Each accommodation includes everything you require to make Talga Estate your home-away from-home. With full kitchen facilities and a luxurious bathroom suite, the accommodation is sure to meet your needs in style. 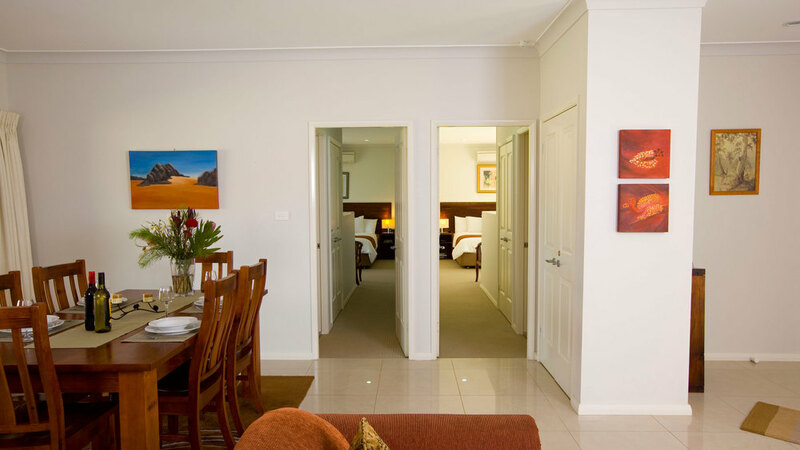 We are more than happy to help you arrange your stay in New South Wales’ finest wine region. Experience all the wine region has to offer, from gourmet food to stunning scenery – and unwind at the end of the day in the comfort of Talga Estate’s luxury accommodation.